(CNN) -- Oil industry experts said there is no sure-fire way to stop the massive amount of oil gushing into the Gulf of Mexico. If there were, BP wouldn't still be grasping for a solution. "That's because pollution cleanup technology is primitive," said Robert Bea, a University of California-Berkeley professor who directs the university's Center for Catastrophic Risk Management. He worked for decades as a risk assessor to oil companies, including BP in the 1990s. The science of cleaning up oil spills has remained largely the same since the 1989 Exxon Valdez disaster, said Bea, who worked on that 11-million-gallon spill in Prince William Sound that blackened 1,500 miles of Alaska's coastline. "It boggles my mind what in the hell they're doing, because the industry has been around for years, and this kind of thing had to be anticipated," Bea said. "But that's just the way it is. It's sad." Since an explosion on the Deepwater Horizon drilling rig April 20, BP has tried various techniques to stop the leak 5,000 feet underwater. The spill is sending 210,000 gallons of crude into the Gulf of Mexico each day, BP has said. Video emerged Wednesday showing a giant leak on the floor of the Gulf shooting a huge plume of oil and gas into the water. Shortly after the leak was discovered, BP tried using remote-controlled submarine devices to stop it. That didn't work. In the past week, two other techniques were tried. The first was a huge containment dome that would have captured the oil so it could be siphoned off to a waiting tanker. But ice crystals formed when escaping gas mixed with water, thwarting that effort. Then, BP announced it was employing a similar, but smaller device called a "Top Hat." The 5-foot structure weighing nearly 2 tons reached the Gulf's floor on Wednesday, and crews are trying to position it over the leak. If that doesn't work, BP says it has yet another plan -- sending a "junk shot" -- loads of shredded rubber tires and golf balls, to clog the leak at the source. Meanwhile, a Coast Guard effort to mitigate effects of the slick by using what a spokesman called a "historically proven technique" of burning the oil and sending the resulting smoke and soot out to sea proved less effective than was hoped. BP has been using using a chemical dispersant, Corexit, to try to break up the oil. The substance was synthesized by Exxon and has been the industry's go-to dispersant for years, Bea said. It dilutes oil the way soap breaks up dirt on the body. However Corexit, whose makeup isn't disclosed by its manufacturer because of trade secrets, could be extremely toxic in large quantities, Bea said. "We [in the oil industry] would always say, 'If you touch it, smell it, breathe it, eat it, you better see a doctor quick," he said. "That's a quick tip to me that my friends, the bluefin tuna, are going to be just as sensitive. The victims of this disaster will be aquatic life." Corexit 9500 includes petroleum distillates, propylene glycol and a proprietary organic sulfonic salt and can cause eye or skin irritation with prolonged contact, according to its material data safety sheet. The document warns that "repeated or prolonged exposure may irritate the respiratory tract." Ed Overton, a Louisiana State University environmental sciences professor, agrees with Bea that pollution cleanup technology is woefully behind the times. "I don't think there is a very good system set up to evaluate those dispersants," said Overton, who heads NOAA's chemical hazard assessment team analyzing the toxicity of the oil in the Gulf. "Testing has for years been not as sophisticated" within the oil industry as he and other environmental scientists would like, Overton said. A wave pool in Leonardo, New Jersey, is used to test the effectiveness of dispersants. The pool is 203 meters long by 20 meters wide by 3.4 meters deep, and is filled with 2.6 million gallons of saltwater. "They can spray oil on the dispersants and measure how much gets into the water," Overton said. "But at best, that's still a fairly crude way to test the effectiveness of these chemicals because it's done under one set of wave conditions." Steve Newman, the president and CEO of Transocean, the world's largest offshore drilling contractor and owner of the Deepwater Horizon rig, answered questions about the industry's cleanup technologies Wednesday during a House hearing on the spill. Rep. Lois Capps pointed to a document provided by Transocean stating that floating booms used to clean up oil spills only contain about 15 percent of the oil, a rate that has not improved since a Union Oil spill in 1969 off Santa Barbara, California -- in Capps' Congressional district -- released about 200,000 gallons of crude over a 10-day period. Capps asked oil executives why the technologies haven't improved if "the technologies have been perfected to get down there and [to get oil]. 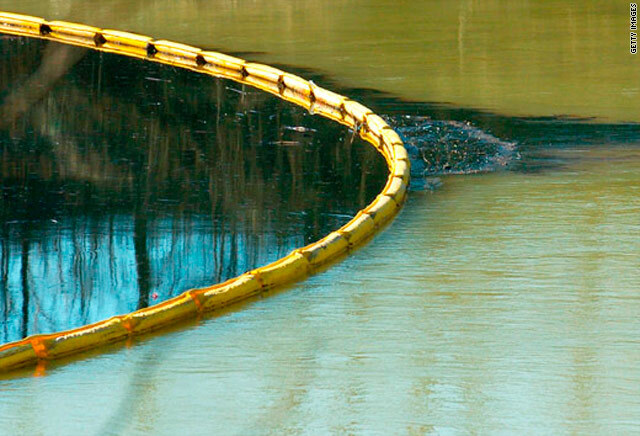 ...Why was there not equivalent technology developed to clean up after a spill, whether a small spill or a huge spill, at the very same time, using some of the profits that have been generated in each of the companies that you represent?" Lamar McKay, the president and chairman of BP America, answered: "I would just comment we're working very closely with all the government agencies, EPA, Coast Guard. "[The] Coast Guard deals with spills all over our coastal areas, all over the country. We're using the best available technology at scale. This is the largest effort that's ever been put together, so we believe we are using the best technology." Rep. Jan Schakowsky, D-Illinois, said, "But you never had any until it happened." McKay answered: "Well, we've been drilling with the Coast Guard for years, since the..."
Schakowsky interrupted: "Did you develop technologies for dealing with this?" McKay: "Not individual technologies for this, no." Schakowsky: "I rest my case."